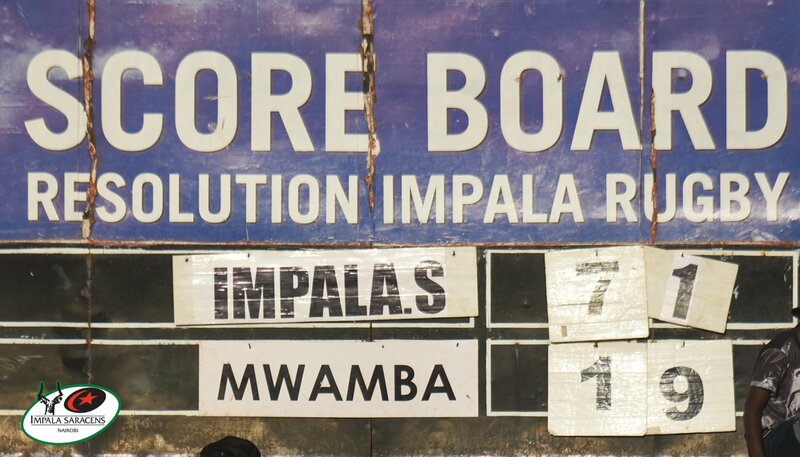 Impala Saracens progressed to the semifinals of the Enterprise Cup beating Mwamba RFC 71-19 at Impala Club o Sat April 13, 2019. The Sarries ran in 11 tries -eight converted- against Mwamba’s three tries and two conversions. They had scored six tries by halftime to lead 38-14 with the rest of the tries coming in the second half as well as Mwamba’s last touch down through Yaya Hussein. Impala will head to KCB for the Enterprise Cup semis after the latter beat Top Fry Nakuru 36-18. The other semifinal will be between Kabras Sugar and Kenya Harlequin. Captain Samson Onsomu began the whitewash going over just after kick-off with winger Quinto Oongo booting the extras. Kenya 7s international Collins Injera cancelled out Onsomu’s try but Kulabu would be reduced to 14 after Mike Agevi’s yellow card which saw Impala take advantage for Billy Omondi to go over. Fullback Sammy Oliech would land Impala’s third after some good hands but Injera came through again for Mwamba to make it 19-14. Ajo, Steve Juma and Quinto Oongo rounded off first half scoring. A clever kick found Kerre to make it 45-14 before the scoreboard read 50-14 after Billy Omondi’s second. Oongo and Nyandigisi made it 71-14 with Hussein coming through with Mwamba’s last but the conversion went wide.